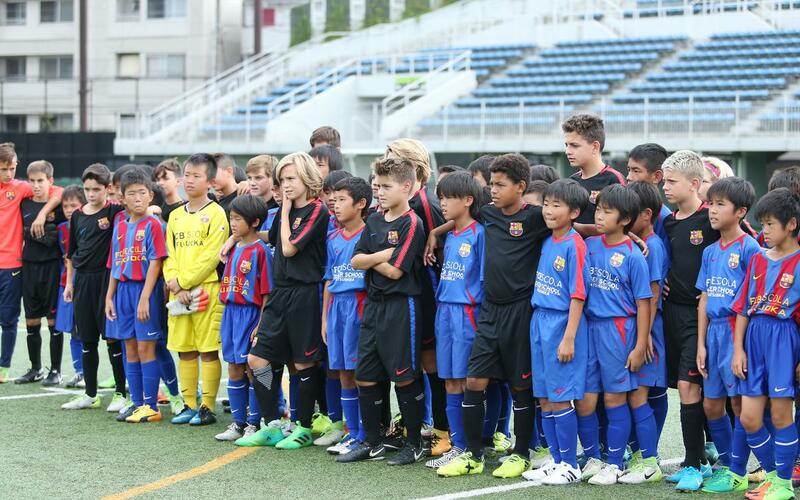 FC Barcelona’s U13B side enjoyed a day of training sessions and friendly matches against the Katsushika and Fukuoka FCBEscoles during their trip to Japan for the World Challenge Cup. The day was a coming together of the academy in Barcelona and the Japanese schools with the common denominator being they all wore the Barça crest on their shirts. In the joint training sessions, the coaches mixed up the players from all three teams before the U12B side did some exercises alone during their preseason. Once it finished, the teams played one another in a round-robin set of matches. The match between the two Japanese FCBEscoles was managed by the coaches David Sánchez and Pep Olivé. The U13B coaches and players went home with some souvenirs like an image from the Oliver and Benji TV show and a ‘sensu’, a Japanese fan.